The idea of writing this post was passing through my head every time I was getting a new inquiry for Barcelona engagement photography. Time flies, but finally, I found time to write this post. I’ve shot many engagement and secret proposals lately. Specifically, when receiving inquiries I see that many of you visit Barcelona for the first time and you used to ask me about best locations where to have the photoshoot. So, it’s time to make your planning easier. 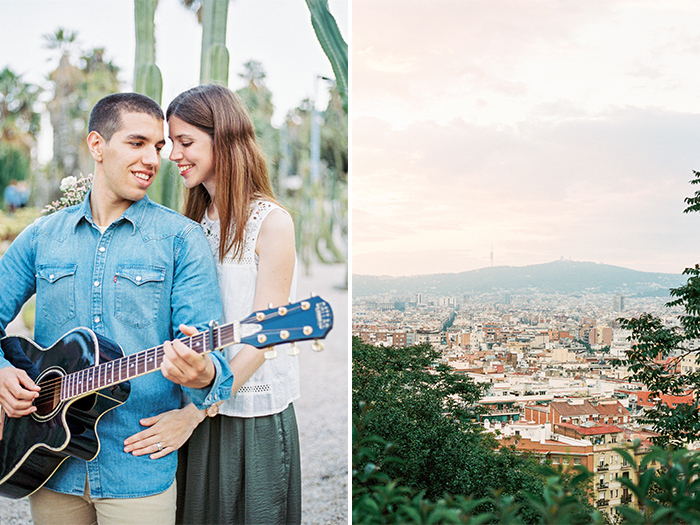 This post includes my list of top 5 places for Barcelona engagement photography. The Gothic quarter during early morning hours with its elegance and narrow streets. This is probably one of the most famous spots I’ve shot at. The absolutely amazing Bishop’s bridge will let you impressed for sure. All around the Cathedral of Barcelona worth being captured. Another one, no less beautiful and very photogenic spot in the area is my all time favorite Plaza San Felipe Neri. Cozy and tidy with a small fountain in the center of the square, this place used to be calm and almost empty early in the morning. Going down in the direction of port, you can sit, take a cup of good coffee at Plaza Reial meanwhile I will try to discreetly take some candid photos of you two. Obviously, these are just some spots of many others we can go through during the photoshoot at the Gothic quarter. 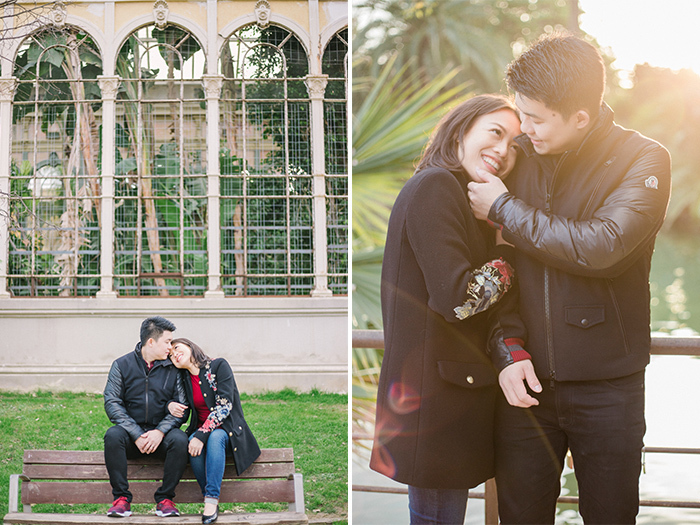 2.The Park Güell is the main pearl and probably the “typical” spot for Barcelona engagement photography. Indeed, it’s the most requested for the photoshoot. To tell the truth, I really love it, because it’s romance and elegant. Being such a famous location, you should know and admit that it’s a very-very popular place and it’s pretty complicated to avoid crowded areas. Because, well this park is a must visit of Barcelona. Don’t be afraid, there are some tricks on how to take amazing portraits with your love with that beautiful scenery without a people everywhere. But it’s another topic for another post. The secret is – scheduling the session at the right time. 3. The Montjuïc park worth being at this list just because of that panoramic view it offers from almost everywhere. What I love more about this locations – its diversity! You can find here a greek styled park, cactus park, castle or beautiful MNAC museum, or a lot of small, green and very cute corners. Schedule the photoshoot 1-2- hours before the sunset and you’ll love it! 4. The Parc de la Ciutadella is the next spot on my list. I call it Barcelona’s central park :) Because you can find a small lake over here and rent a boat. Also, you can go up at the super-duper beautiful fountain and enjoy the view from above. Or even take a blanket and have a picnic previously buying something delicious at La Boqueria market. 5. The Parc del Laberint d’Horta is the last spot on my list of favorite locations. I left it at the end because this park is definitely the most romantic spot you can find in Barcelona. Is my favorite when it comes to the secret proposal. The park is a bit far from the city center what sometimes makes it hard to find. But here is a point, it makes it ideal for the proposal! I hope you enjoyed this post and at least you can pick up some ideas for your Barcelona engagement photography session. My help in planning your photoshoot doesn’t end up here. Say hello here and tell me a bit more about you two and together we’ll choose the best location for you. Cheers!